A few weeks after we arrived and fell in to our routine of working at Oasis, we began to do some interviews. The process had already been in place, but never fully enforced: kids would arrive at the center, be interviewed and photographed and then placed in a classroom. The files would be typed-up, photo placed at the top of the page, printed out and put in a notebook filled with children's stories. 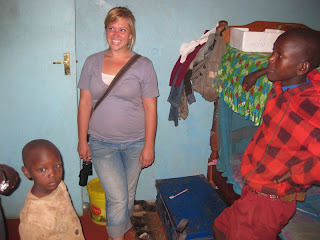 One day, in the midst of several interviews, we met 6-year-old Kamau (pronounced Cuh-Mao...as in the General). If you've been reading my blog, you've seen dozens of pictures of this boy since then...he's definitely one of my favorites. Today, we got to be a part of Kamau's story. 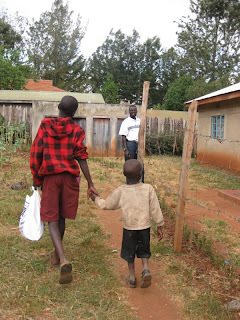 Today, Kamau was moved off of the streets (where he was living with his mother) and take him to Oasis Boys House 3. 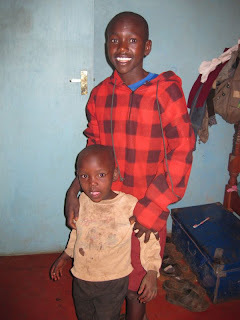 When we arrived this morning, Geoffrey told us that he had already spoken with Kamau's mother and she had gone to gather his belongings so he could be taken to school. She returned with a bag (a grocery sack...everything he owns). 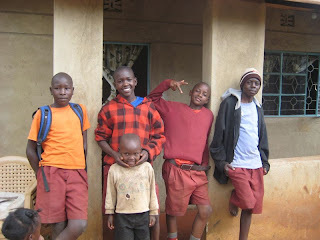 After lunch at Oasis, Daina and I took Kamau (and Joseph from House 3) to the store to buy a few things for Kamau: toothbrush, underpants, socks, sandals, two shirts and a towel...oh, and a chocolate bar. I'm not sure what the other shoppers thought we were doing, but they were all very curious...they stopped to gawk at us (two white girls with this tiny, filthy boy). Once he had some new clothes, we drove him to the house. Joseph (who is about 14) said he was sure this was Kamau's first time in a car...he was leaning forward to look out the front window, silent, but watching everything. We brought him in the house and Geoffrey gave him a tour: kitchen, bathroom, his new room...turns out, he wets the bed and we forgot a mattress cover, but we can fix that tomorrow. It was obvious that Kamau was a little nervous and maybe even a little sad about leaving his mother and moving in to a new place...but Friday night is chapati night...and tomorrow we're celebrating Daina's birthday with sodas and a movie in town...so I'll bet, by this time next week, he will be comfortably loving his new life. Dangit! That is the best news I have heard! Tell Kamau I love him and I freakin love him even more than that! Wow. Your life is going to be soooo dull when you get back. Wow.